As a professional sticker and label printer, we use different printing methods to provide quality labels and stickers to our customers. Each printing process offers unique print characteristics which are matched to our clients requirements. 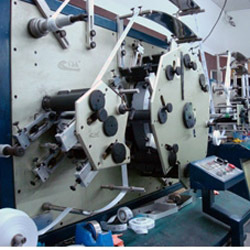 Below we will show you a few printing processes used in our label factory on our products. 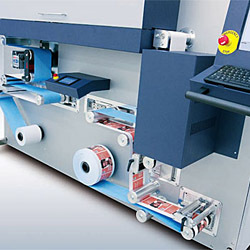 Flexo printing is the most common used pressure sensitive label printing process today. It economically produces quality labels at High speeds. Flexo inks are very thin, water-based, making them ideal for four color process printing (CMYK). 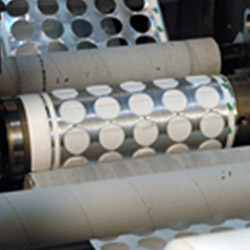 In a continuous roll process like flexo, plate cylinders must be the same diameter as the plate length. The plate cylinder is always the same diameter no matter how long the repeat plate length is. The substrate passes over the plate then re-inserts to the starting position to achieve a continuous print. Screen printing employs a high mesh screen that is stretched over a frame and covered with a photosensitive emulsion. A film negative is placed over the screen which is then exposed to high intensity light. Only one color could be applied at a time and the ink must be allowed to dry before the next color is applied. Our digital presses are intermittent roll-to-roll presses. Images are created by an electronically charged metal plate called the photo imaging plate. All of the inks and processing fluids are recycled within the press making it very efficient with consumables. We offer die-cutting in sheet and roll forms, as well as digital knife and laser-cutting, providing a low cost alternative for short runs or unusual shapes. For high volume jobs, precision steel rule dies are employed which ensure reliable cutting over a long period of time. For shorter runs that will only be printed a limited number of times, more economical magnetic dies may be utilized. Labels are usually printed across the web to maximize material usage, resulting in many labels printed across the width of the material. Slitting is accomplished by means of specialized equipment with adjustable rotary cutting blades, tensioning rollers and label counters.